Special effects, animated actors, entire sets and spaces that weren't physically present during filming: these aquamarine-colored surfaces are almost conjuring windows through which other environments can be optically inserted into filmed representations of the present moment. These sorts of walls and surfaces are not architecture, we might say, but pure spatial effects, a kind of representational sleight of hand through which the boundaries and contents of a location can be infinitely expanded. There is no "building," then, to put this in Matrix-speak; there are only spatial implications. Green screen architecture, here, would simply be a visual space-holder through which to substitute other environments entirely: a kind of permanent, physically real special effect that, in the end, is just a coat of paint. It's interesting, in this interpretation, that "green screens" or a rough optical equivalent are not more commonly utilized in architectural or interior design—even if only as an ironic gesture toward the possibility that, say, a group of friends taking photographs in your living room, with its weird green wall on one side, or in the lobby of that hotel, with its green screen backdrop, might somehow be able to insert into the resulting photographs otherwise non-present spatial realities, as if they had been photographed in front of a Stargate or a Holodeck, a window creaking open between worlds. To your point that there are only "spatial implications" -- and contra your title "fifth wall" -- one cannot forget the lighting (as with the photo above) that removes the shadows from our euclidean green box to create a pure chroma-field. 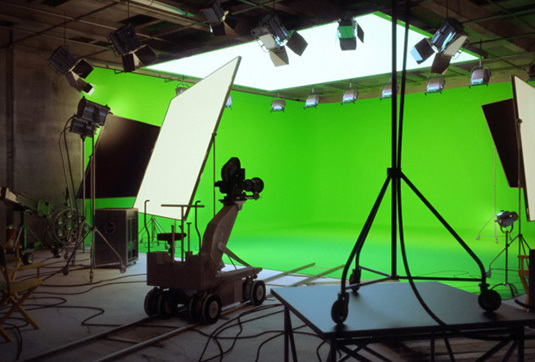 While other technologies certainly are necessary for the post-effects, the lighting assemblage is directly part of the greenscreen apparatus -- key for the lobby of that hotel or whatnot. Tyler, thanks for the heads up - seems to be working for me, though (on Safari). I'll take a longer look and make sure it's in all browsers.